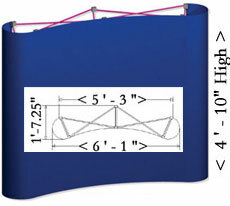 Gamma 6 foot Table Top curved pop-up displays are light-weight, rugged, and easy to assemble. An attractive addition to any exhibit space, our table top displays are easily transported due to their compact size and weight (less than 35 lbs.). 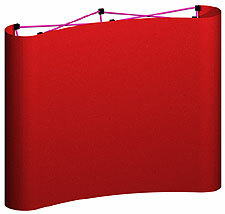 The basic display comes complete with two photographic front panels and 2 fabric end panels. Attach them to the central pole.